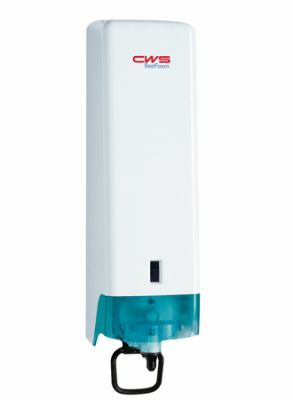 Economical and environmentally-friendly soap-dispenser for 1000 ml of soap concentrate. Reduces the amount of soap used by foaming up the soap concentrate by up to 50%. With 2500 portions, the dispenser produces a large amount of soap and is particularly suited to washrooms that are highly frequented. One-way bottles, ergonomic one-hand operation, optical filling level, "click in bottle function and "easy cleaning" make service easier.